…Or How I Learned to Stop Worrying and Love Torture. Hollywood’s attempts to address its nation’s quixotic ‘war on terror’ have met with lopsided results – for every ‘The Hurt Locker’ there is a rash of ‘Renditions ’, ‘Brothers’ or ‘Lions for Lambs’. In an industry that seems congenitally incapable of sincerity at times, its forays into a real world with real consequences have often been spectacularly crass. A good case in point is this straight-to-DVD offering, which fancies itself a ‘psychological thriller’ addressing ‘contemporary concerns’. H (Samuel L. Jackson) is a black-ops interrogator indentured to the shadier elements of the intelligence community – possibly because he has committed war crimes. 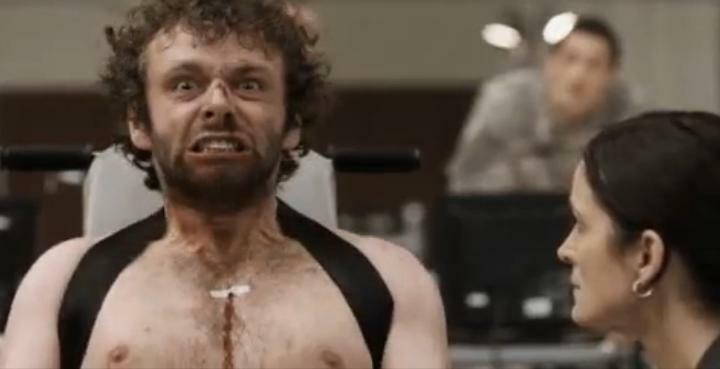 He gruesomely tortures a home-grown terror suspect (Michael Sheen) who claims to have planted nuclear bombs in three American cities. By-the-book FBI agent Brody (Carrie-Anne Moss) is appalled by what she sees and indulges in a protracted bout of hand-wringing over this flagrant breach of international law. Brody and H argue over the efficacy of using torture, with Brody maintaining that any information gained under such conditions is inherently unreliable and H insisting that it is a necessary evil to protect American citizens. This ‘brave, uncompromising’ look at the murky world of national security is in reality a TV movie with pretensions, a plodding ‘race against time’ thriller dressed up in esoteric terminology and cutting-edge finery. Jackson’s character is a mixture of Jack Bauer and Axel Foley, a wise-cracking psychopath we’re encouraged to sympathize with and root for. The contrast with Moss’s character couldn’t be starker. While H is a family man, Brody is a childless, unmarried career woman with a chilly demeanour – although we’re told that, like every career woman, her biological imperatives will win out in the end. Brody is portrayed as an uptight obstruction for her insistence on invoking the Geneva Convention at every turn while the maverick H is taking care of business. This dynamic essentially plays like a mismatched pairing in a cop movie, which would be fine if it wasn’t being used in such a grave context. It seriously undermines the film’s already shaky credibility that the characters fall into this archetypal ‘good cop, bad cop’ double act. Sheen bleeds and screams his way through the film as the ‘all-American’ Jihadist, but no attempt is made to provide any dimension to his character, to explain his motivation beyond the usual ideological bluster. This would have been a more interesting film than the one presented, a character study to which the gifted Sheen would have been better suited. A noteworthy feature of ‘Unthinkable’ is the relative absence of middle-eastern characters. It shies away from making the connection between Islamic fundamentalism and young, disenchanted Muslim men. If they really had been committed to dealing with the issue in a frank, realistic way, the filmmakers surely wouldn’t have baulked at the idea of featuring such a character. Their bravery obviously only extended so far. ‘Unthinkable’ may believe it is a dispassionate attempt to encourage debate and address the issues in an even-handed manner, but it is nothing of the sort; the narrative arc leaves little doubt as to where its sympathies lie. Brody is there to present the illusion of balance, but its opinions are so firmly fixed and the dialogue so perfunctory that it feels like a 1950s propaganda piece. I kept waiting for it to pull back and reveal some deeper insight, but no such revelation occurred. ‘Unthinkable’ is blind to the intricacies of its subject matter, peddling easy answers and presenting a worldview as hopelessly atavistic as the zealots it sets out to decry, plumbing new depths of apologia and chauvinism. Its ultimate message is that torture works, that the ends justify the means, long-term consequences be damned. H is depicted as a man of action hamstrung by politically correct Quislings, a true patriot desperate to save his countrymen by any means. This is a shameful glorification of American Exceptionalism; a concession to those who believe that global treaties are an obstacle to domestic security, that the checks and balances preventing the abuse of executive power can be overridden on a whim. It’s sad when issues as pressing and complex as this are reduced to fodder for formulaic, ham-fisted thrillers. I have no doubt that Donald Rumsfeld would heartily approve. Youth and subculture are perennial lightning rods for the delicate sensibilities of polite society, with each transmutation serving to stir the fear and suspicion that first rumbled onto the silver screen with the Black Rebel Motorcycle Club. The ‘Chav Horror’ motif that was used to grisly effect in ‘Eden Lake’ seems to be developing into a sub-genre of its own, with the tracksuited ‘yobs’ as our very own version of the demented rednecks in American ‘backwoods terror’ flicks. On the surface, ‘Heartless’ sounds like just this kind of ‘Daily-Mail-reader’s-wildest-imaginings-come-to-life’ endeavour, with its marauding gangs of ‘hoodies’ terrorizing communities, gang disputes spreading beyond their traditional boundaries and ominous tower blocks housing all manner of iniquity. But this is more than a crass exploitation film, channelling tabloid outrage for a quick buck. Jamie Morgan (Jim Sturgess) is a timid photographer born with a heart-shaped birthmark on his face. When not dodging the taunts of scornful youths, Jamie documents the neglected margins beyond the gentrified centre, rummaging through the detritus for pictorial inspiration. On one such excursion he comes into contact with a gang that is vastly different from the ones he regularly encounters, fleeing before he can investigate further. His foreboding proves to be well-founded when the gang kills his mother before his very eyes. Jamie’s despair at the morally bankrupt world around him leads to a meeting with Papa B (Joseph Mawle), who offers him a life free from ridicule, in exchange for assisting him in the creation of his Kingdom of Horror. ‘Heartless’ presents a hyper-stylized urban dystopia that bears as much relation to modern London as ‘Blade Runner’ did to Los Angeles in 1982; positively Dickensian in its portrayal of squalor. But this is by no means a criticism; the expressionistic lighting and gothic mis-en-scene of its doom-laden inner-city backdrop is so visually arresting that it compensates for any lack of veracity. The world presented in ‘Heartless’ is a landscape of the mind, an abstract plain filled with apocalyptic dread, the product of a rudderless subconscious, a fevered imagination seeing monsters lurking around every corner. Music is a useful adjunct to this, with David Julyan’s stirring collection of original songs articulating Jamie’s mental state like a running commentary. The film’s unremitting grimness is countervailed to some extent by a dose of good old-fashioned British whimsy from the likes of Ruth Sheen and Eddie Marsan, adding to the ‘Mike Leigh meets John Milton’ feel that prevails. Sturgess brings an intensity and poignancy to the role of a man who must indulge in the corruption of the world to be accepted by it; a loner hiding behind the comfort of the camera lens like Mark Lewis in ‘Peeping Tom’ and sitting in his room plotting vengeance like Travis Bickle in ‘Taxi Driver’. Jopseh Mawle strikes a sinister note as the infernal Papa B. Though he serves as little more than a plot device delivering expository dialogue, he takes to the role with considerable élan, not falling into the trap of rehashing the typical Faustian tack of portraying him as a sybaritic sophisticate. Noel Clarke – the designated voice of ‘the kidults’ – makes a brief appearance as Jamie’s neighbour and reformed gangster, AJ; adding ‘street’ credibility to proceedings but little else. The friendship between AJ and Jamie is something that could have been developed further; they appear together in a couple of scenes before AJ disappears, as does much of the cast as the film progresses. Which is the strongest indication that none of what transpires in the film is occurring outside the confines of Jamie’s head. From the stagey streets to the gaps in logic, ‘Heartless’ has the gaudy unreality of a vivid nightmare; like a Lynchian portrait of suburbia transposed to the decaying metropolis, there are elements that appear off kilter. ‘Heartless’ is certainly a cut above what currently passes for horror; writer/director Phillip Ridley clearly understands that the best horror is cerebral, dabbling with social, moral and philosophical issues while evoking an eeriness that is more effective than all the gore in the world. The film’s ultimate message is that horror is all around us; that Hell is human construct, a repository for our worst impulses and appetites, that we create the monsters and set these elemental conflicts in motion. ‘Heartless’ is that rarest of creatures; a British horror film that isn’t in thrall to whatever high-concept brutality is in vogue Stateside. Would you hug this hoodie? Ridley Scott has turned his hand to a multitude of genres: Sci-Fi, Sword and Scandal Epic, Jingoistic War Film, Factually Dubious Historical Action Spectacular, Feministic Road Movie and whatever ‘Legend’ was supposed to be. Scott is a director with an unerring gift for taking the lacklustre and the hackneyed and swathing it in a carapace of lush, pulchritudinous visuals and dense, arresting backdrops. ‘American Gangster’ is his first foray into the world of the crime drama since the ludicrous ‘80s gloss-fest ‘Black Rain’. Does ‘American Gangster’ rectify this glaring rebuttal to his reputation as the ultimate genre director? In a manner, it does, ‘American Gangster’ is a perfectly proficient piece of film-making, but it isn’t without its faults. ‘American Gangster’ charts the rise of Frank Lucas (Denzel Washington), from local flunky in 1970s Harlem to international druglord and organized crime kingpin. Following the death of his mentor, ‘Bumpy’ Johnson (Clarence Williams III) Lucas vies for control of Harlem with a plethora of rivals – most notably Idris Elba as the cocksure Tango. Lucas begins smuggling a cheap and potent new strain of heroin out of Vietnam, bringing his family from the Carolina sticks to back him up. Parallel to this is the turning point in the life and career of Richie Roberts (Russell Crowe) an ambitious detective and aspiring lawyer swimming in a cesspit of corruption. When he discovers a million dollars in cash in the trunk of a car, he is vilified for deciding to turn it in. After being outcast by his crooked brethren in the force and losing his partner to an overdose, Roberts is asked to head up his own unit, investigating the source of this new drug, named Blue Magic. The higher Lucas rises, the more he contravenes his own rule to remain inconspicuous, which brings him to the attention of the Special Narcotics Bureau, as well as some less upstanding sections of law enforcement. Washington exudes his customary poise and charisma, solidifying his reputation as the most dependable leading man in Hollywood; it seems that there is no film he cannot elevate by his mere presence. Crowe turns in his best performance since ‘The Insider’, imbued with a focus and pathos missing from his more grandstanding, Oscar-coveting roles. Also of note are the performances of Josh Brolin as the unctuous Trupo – which bears favourable comparison to Nick Nolte’s hard-bitten turn in ‘Q&A’ – Chitewel Ejiofor as Frank’s guileless brother, Huey, Ruby Dee as the long-suffering Mama Lucas and fully paid-up member of the Wu Tang Clan, RZA, as Moses Jones. But not even this profusion of talent can compensate for the feeling that ‘American Gangster’ has nothing at its centre. He may be a great technician, but Scott’s films are not renowned for their emotional depth. A Scorsese or a Lumet may have been able to endow the film with some heart, to unearth some truths in the midst of the chaos and carnage. Indeed, ‘American Gangster’ is at its best when it explores the socio-political factors behind the characters’ actions. Lucas pursues an idiosyncratic variant of the American Dream; the determination, hard work and entrepreneurialism at the heart of its mythology. He is a portent of the coming decade, of corporate hegemony; Reaganomics incarnate. Roberts, on the other hand, is the honest man whose good intentions go unrewarded, beset at every turn by entreaties to fall in line and look the other way. Sadly, this is not explored in any great detail, taking a backseat to the usual cat-and-mouse template. ‘American Gangster’ draws on all manner of influences, from blaxploitation classics like ‘Superfly’ and ‘Black Caesar’ to New Hollywood gems like ‘Serpico’ and ‘The French Connection’. The problem is that, by invoking these films, it simply serves to remind us how great they are and how ‘American Gangster’ lacks the vivid grittiness, urgency and brutality of its progenitors, feeling more like a compilation of classic clips than a coherent whole. Like anything Ridley Scott is involved in, it looks amazing, but its resplendence is part of its weakness, with the trademark ‘Scott sheen’ having a distancing effect, wrapping the characters in a layer of honey. Another shortcoming is Steve Zaillian’s screenplay, which does little to rectify some of the clichés that have bedevilled the genre: the violent, ruthless ganglord who is a devoted family man at heart, the obsessed cop whose personal life is falling apart around him, etc. While it at least resists the temptation to glorify the ugly realities of Lucas’s milieu or present a black-and-white morality, it treads a familiar path and it’s disheartening to see so many archetypes being perpetuated yet again. A little more ‘artistic license’ could have benefited the denouement; the scenes between Washington and Crowe fall below expectation after so much build up. Strict verisimilitude is not always the preferred course. The end result is a sprawling endeavor with epic pretensions and a misplaced sense of importance for what is essentially a stylized, big budget B movie. Denzel and Russell recreate their favourite scene from 'Heat'.